Warhammer 40,000: Dawn of War II – Retribution is the stand-alone second expansion to Warhammer 40,000: Dawn of War II. 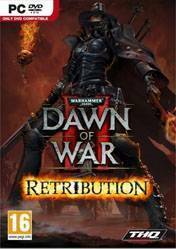 Dawn of War II: Retribution takes place ten years after events of Dawn of War II: Chaos Rising. The sub-sector is now suffering from conflict between Ork pirates called the Freebooterz led by Kaptin Bluddflagg to pillage the sub-sector,the arrival of the Eldar of the Craftworld Alaitoc led by Autarch Kayleth to seek about a prophecy and recovering an ancient artifact,a Tyranid Hive Lord restoring the remnants of the Hive Fleet Leviathan and to the link of the Hive Mind,the Blood Ravens defending the sub-sector led by Captain Apollo Diomedes to hunt down Chaos as well as investigating their Chapter Master, Azariah Kyras, for being corrupted by Chaos,the return of Chaos Space Marines of the Black Legion led by Eliphas the Inheritor to fulfill his promise to Abaddon the Despoiler to annihilate the Blood Ravens,and the newly arriving Imperial Guard of the 8th Cadian Regiment led by Lord General Castor, performing an Exterminatus under Inquisitor Adrastia to investigate for corruption within Sub-sector Aurelia as well as the Blood Ravens' Chapter Master Azariah Kyras. Similar gameplay to Company of Heroes, but in the world of Warhammer!